Make 6 chain stitches. Crochet around this row of chain stitches, start from the second chain stitch from your hook. Check the video for details. Fasten off and leave a tail to sew the belly to the body tomorrow. Make 4 chain stitches. Crochet around this row of chain stitches, start from the second chain stitch from your hook. Fasten off and leave a tail to sew the beak to the body tomorrow. That’s it already! Did you manage to make the chain stitches? Easy peasy right? ;) If you have any questions, let me know in the comments below! Or maybe you landed on this page and have no idea whats going on, then check out this page first. Press the foot flat. Crochet the edges together with 5 sc. Check the video for all the details. Fasten off and leave a tail to later sew the foot to the body. Close the last round and fasten off. Leave a tail to later sew the wing to the body. When you have made two feet and two wings you are all ready for today! Did you manage to make the fiddly small pieces? It takes a bit of patience to learn doesn’t it? But you will see you will get better with every stitch. And? How did it go yesterday? So great you’re crocheting along. Today will be about filling and finishing off the body. We will also give Puck some safety eyes. Ready for some more crochet? Let’s get started! First we can place the eyes. Take a safety eye and place it in the center of the magic loop of one of the white circles you made yesterday. Then push it through the body on one of the BLO stitches in the 6th round. You recognize them by a small horizontal stitch. Do the same for the other eye. Secure the saftey eyes by placing the washers inside of the body. Leave all the tails of the eyes where they are. We will sew the white part of the eyes to the body on the last day. dec. means decrease. To make a decrease you will crochet two single crochets together. Now you can stuff the body of the penguin. Use a pencil or the back of your crochet hook to get the stuffing in easily. Close the small hole that is left in your final round. Fasten off the thread. I think I’m going to start another Puck in a multi color yarn. What color are you using for Puck? Whoop whoop! Are you as exciting as I am? :) So great to have you here. We are going to have lot’s of fun crocheting Puck together. Do you have all your materials ready? If not, check out this blog post about what you need for Puck. Today we will be learning how to make a magic loop, how to make your first single crochet and how to increase. 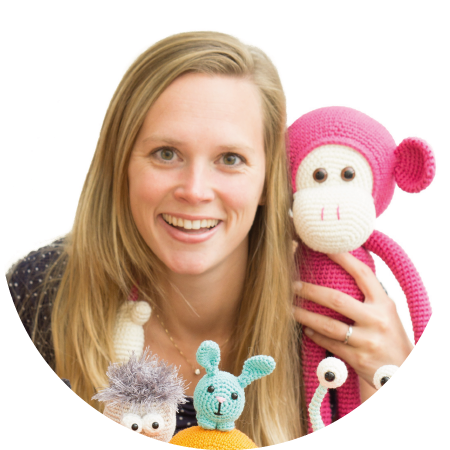 I’ll be crocheting with you through a YouTube video. This is the pattern of what we will be making today. 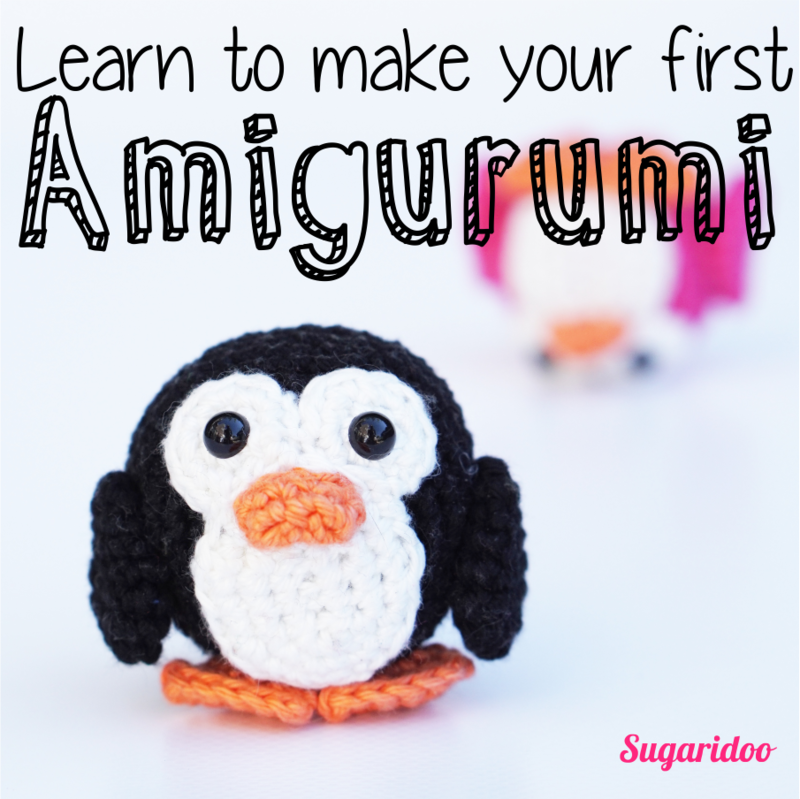 With amigurumi you crochet in rounds. A pattern will tell you for each round what you need to do. Round 2: make 6 increases. This will give you 12 single crochets in your round. Fasten off and leave a tail to later sew the eyes to the body. Check the video on how to finish off your yarn. Comment down below to let us know you’re joining the crochet along! Yay it’s Friday! Do you have any fun plans for the weekend? I’m going to the zoo tomorrow :) I love the zoo! 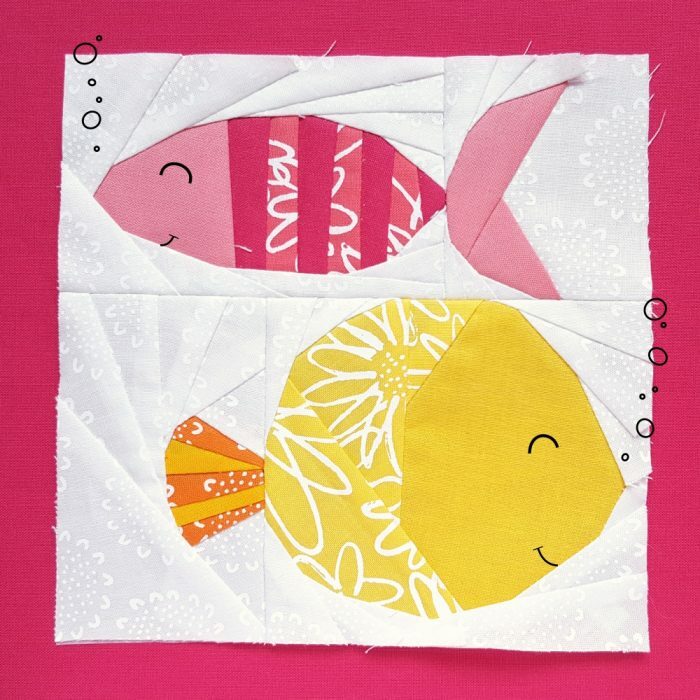 Maybe I even get some new ideas for more Sugaridoodles or animal blocks for the Sugaridoo Sampler. Since I missed the work in progress Wednesday that I planned for this week I wanted do quickly share the quilt blocks I’ve been working on this week. I have finished 16 of the 57 blocks. I’m getting somewhere. I hope to finish all the blocks this month, but that might be a bit too ambitious. In blue we have Freddy and Ferdinand. And these ladies in pink are Fiona and Francine. I love making these blocks. They are just so fun! 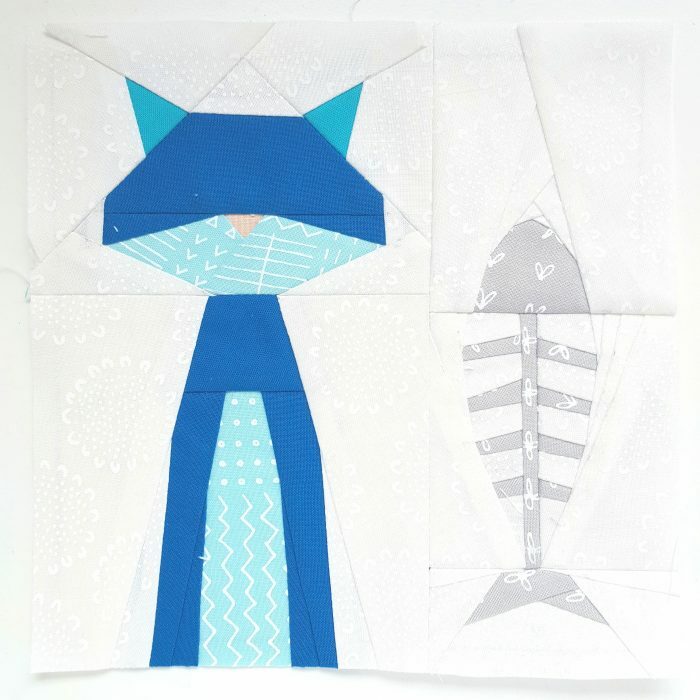 Besides the fishes I worked on the cat and dog blocks. The bunny also belongs in there, but I haven’t got to that one yet. This green fellow above is the Dapper Doggy and below you see the Smitten Kitten block in blue. Both need some eyes, but I’m not sure yet how I want to embroider them. 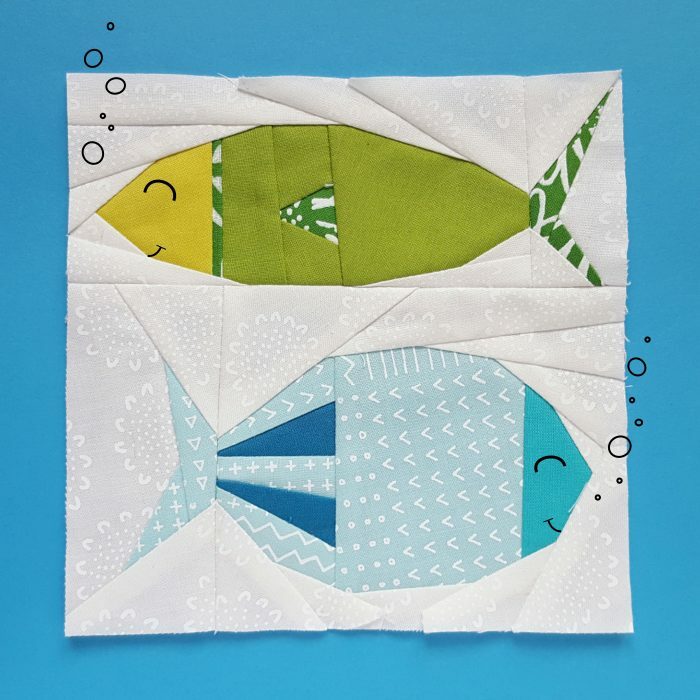 They are both made with the Blueberry Park fabric line by Karen Lewis combined with Kona Cotton solids. Love love love those fabrics! It’s going to be a sad moment when I finish all of them. So that’s my quilting progress for the last two weeks. What have you been up to? 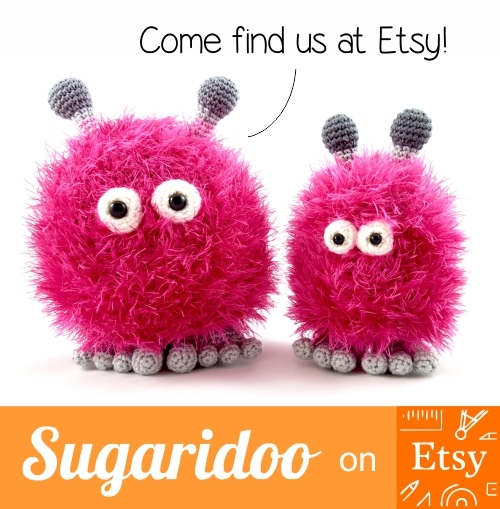 Would you like to make a cute amigurumi (crocheted toy) but don’t know where to start? Yay! You’re in the right place. 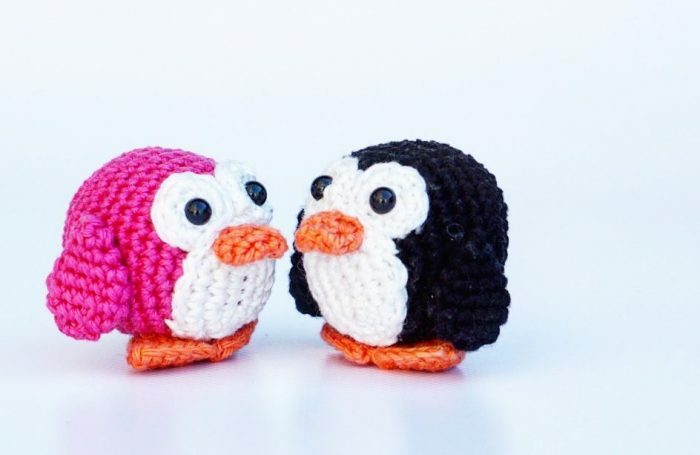 I’m hosting a crochet along where we will make these cute little penguins together. We will take baby steps, so even if you have no clue what a crochet hook looks like you can follow along! Puck is a funny penguin fellow. He loves that he weares a tuxedo all day. At fancy weddings he only has to add a bow tie. Other things Puck loves are ice skating with his friend Pippa and decorating cupcakes. Well mostly eating the cupcakes while Pippa decorates them. I’m not sure if she is just a friend or maybe a little bit his girlfriend. Puck comes from a very special penguin family. They normally paint the eggs before they hatch so all penguin babies come out in special colors. Only Puck was a little bit early to climb out of his egg, so his dad was too late to paint it..
By following all lessons you will learn every technique you need to crochet Puck. We will brake everything down in baby steps, so you will have time to practice what you learn. Every lesson has a video to help you on your way. Materials: today we will talk about the materials. What do you need to start with your first crochet lesson. If you’re running into any crochet related trouble along the way just let me know in the comments on the blog or the Youtube videos. I’ll be here to help you! So tell me about the prizes! Whoop whoop! You can win a prize with this crochet along. The crochet along runs until the 20th of september. Just finish your version of Puck and upload a photo to the final blogpost before the 24th of september to enter the giveaway (or send me an email/facebook message with your picture). Tell me what can I win? By showing me your finished version of Puck you can win three balls of Phildar coton 3 of your color choice together with a Clover Amour 2.5 mm crochet hook! So let’s talk materials. What will you need to make Puck the penguin. Well we need yarn, a crochet hook, safety eyes, some stuffing, a darning needle and a pair of scissors. Puck in the pictures above is made with Phildar coton 3 and a 2.5 mm crochet hook. That combination makes him about 5 cm tall. If you already have some yarn you can just make him with whatever you have lying around. Pick a crochet hook that matches the yarn (check the label of the yarn for this) or that is slightly smaller than the recommended hook size. Are you completely new to any yarn related activities? :) No worries! I posted an article over HERE about all the yarn I like to use for amigurumis and the crochet hooks that go with them. If you have any doubts or questions about the yarn / crochet hook just ask in the comment. For Puck crocheted with a 2.5 mm hook you will need 6 mm black safety eyes. The bigger the yarn you use, the bigger the eyes should be. When crocheting with a 4 mm hook you can probably use 8 mm or 9 mm eyes. For stuffing you can use any material used to fill pillows or toys which you can get in the most craft stores. You need just a tiny bit for this small project. Last things you will need is a darning needle to put the penguin together. That is a needle with a big eye and a blunt point. And of course you need some scissors.